This article is about the audio engineer. For the actor also known as Big Mick, see Mick Walter. He was born in 1960 and grew up in Birmingham, England. While an apprentice at British Steel Corporation, he studied electronics at a local technical college and also gained experience on the thriving Midlands music scene including working as a roadie for Judas Priest. In the early 1980s, working for the PA company Techserve he engineered for bands including UB40, Dennis Brown, Yellowman, and Jungle Man before becoming the touring sound engineer for The Armoury Show, who featured ex The Skids singer Richard Jobson and ex Siouxsie and the Banshees guitarist John McGeoch. The Armoury Show's management company QPrime then asked Mick to engineer a band they had just signed called Metallica (prompting Mick to ask "What's heavy metal?" when told the genre of music they played  ) starting a relationship that has lasted more than 30 years. 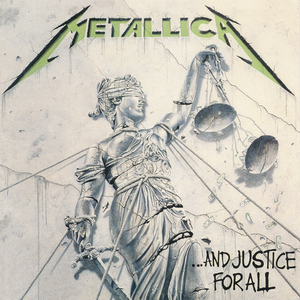 The live mixing technique he is often credited with is adding a high mid "click" to the bass drum, which evolved early on with Metallica as a means of lifting Lars Ulrich's bass drums out of the bottom heavy sound. 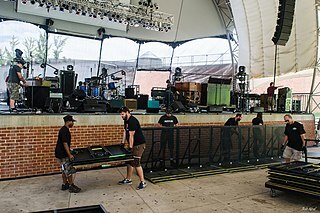 A more recent crusade is to encourage engineers to start soundchecks with ambient microphones (such as vocal microphones) working through to close-miked or gated instruments such as drums. This is in direct opposition to the usual soundcheck which starts with the kick drum and ends with the vocals, but actually makes a lot of sense since the final sound of any instrument is going to be the combination of the ambient and close microphones it can be heard through. In 2007, he was asked to mix the FOH sound for the Led Zeppelin reunion concert  at London's O2 Arena in conjunction with Robert Plant's personal vocal mixer Roy Williams. They used the facilities of the Midas XL8 digital mixing console to allow them to do this on a single desk. He consciously did not use the clicky Metallica bass drum sound, preferring instead to update Jason Bonham's ambient and reverberant drum sound by using a mix of close and ambient drum microphones on his kit,  brought into phase using a 3 or 4ms delay,  and finished with a small amount of digital reverb. The road crew are the technicians or support personnel who travel with a band on tour, usually in sleeper buses, and handle every part of the concert productions except actually performing the music with the musicians. 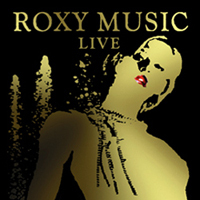 This catch-all term covers many people: tour managers, production managers, stage managers, front of house and monitor engineers, lighting directors, lighting designers, lighting techs, guitar techs, bass techs, drum techs, keyboard techs, pyrotechnicians, security/bodyguards, truck drivers, merchandise crew, and caterers, among others. "When the Levee Breaks" is a country blues song written and first recorded by Kansas Joe McCoy and Memphis Minnie in 1929. The lyrics reflect experiences during the upheaval caused by the Great Mississippi Flood of 1927. Kingdom Come is an American/German heavy metal/hard rock band formed in 1987. 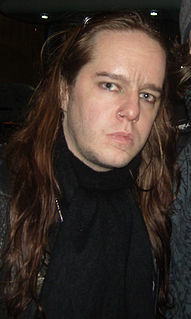 The band was originally fronted by Lenny Wolf, until their hiatus in 2016. 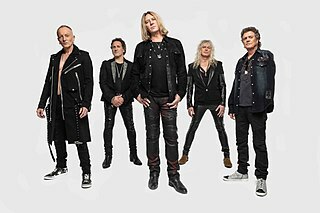 While there have been no constant Kingdom Come members throughout the band's history, their most recent lineup features four original members who left the band in 1989 and returned in 2018. Wolf was replaced by Keith St John in 2018. 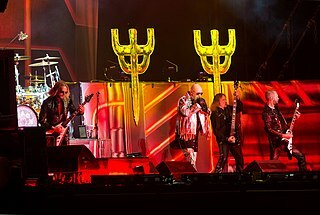 The group's 1988 debut album, Kingdom Come, is to date their most internationally popular and biggest selling recording. Live sound mixing is the blending of multiple sound sources by an audio engineer using a mixing console or software. Sounds that are mixed include those from instruments and voices which are picked up by microphones and pre-recorded material, such as songs on CD or a digital audio player. Individual sources are typically equalised to adjust the bass and treble response and routed to effect processors to ultimately be amplified and reproduced via a loudspeaker system. The live sound engineer listens and balances the various audio sources in a way that best suits the needs of the event. The Ahmet Ertegun Tribute Concert was a benefit concert held in memory of music executive Ahmet Ertegün at the O2 Arena in London on 10 December 2007. 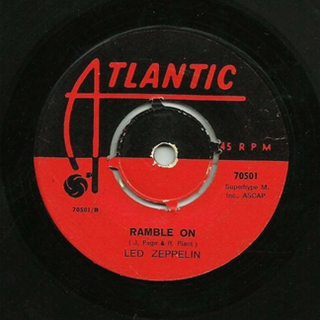 The headline act was the English rock band Led Zeppelin, who performed their first full-length concert for almost three decades, since the death of drummer John Bonham in 1980, in a one-off reunion. Bonham's son Jason Bonham played drums during the band's set, and also provided backing vocals on two songs. A stage monitor system is performer-facing loudspeakers known as monitor speakers or stage monitors on stage during live music performances in which a PA system or sound reinforcement system is used to amplify the performers' singing, music, speech and other sounds for the audience. In Britain the term foldback is often used to describe the system. Monitor speakers are useful when amplified instruments are used with acoustic instruments and voice. 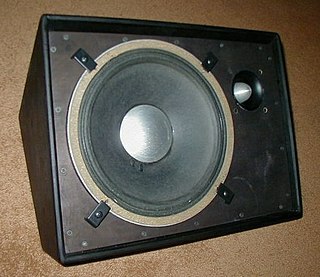 Monitor speakers often include a single full-range loudspeaker and a horn in a cabinet. Monitor speakers have numerous features which facilitate their transportation and protection, including handles, metal corner protectors, sturdy felt covering or paint and a metal grille to protect the speaker. There are two types of monitors: passive monitors consist of a loudspeaker and horn in a cabinet ; active monitors have a loudspeaker, horn and a power amplifier in a single cabinet, which means the signal from the mixing board can be plugged straight into the monitor speaker. Bruce Robert Jackson was an Australian audio engineer who co-founded JANDS, an Australian audio, lighting and staging company. He joined American touring audio engineer Roy Clair and mixed concert stage monitors for Elvis Presley in the 1970s. With Clair Brothers, a concert sound company, Jackson designed audio electronics including a custom mixing console. Beginning in 1978, Jackson toured as Bruce Springsteen's band engineer for a decade, using Clair Brothers sound systems. A business interest in Fairlight CMI in Sydney introduced Jackson to digital audio, and he subsequently founded the digital audio company Apogee Electronics in Santa Monica, California, where he lived at the time. After selling his share of Apogee, Jackson co-founded with Roy and Gene Clair a joint venture which produced the Clair iO, a loudspeaker management system for control of complex concert sound systems. Jackson turned the venture commercial with the help of Dave McGrath's Lake Technology. Dolby Laboratories bought the technology and formed Dolby Lake with Jackson as vice president, then in 2009 Lab.gruppen acquired the brand. Jackson was honoured with the Parnelli Innovator Award in 2005 for his inventive loudspeaker controller. 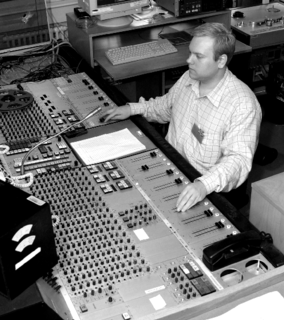 Antony King is a British live audio engineer for Depeche Mode and Nine Inch Nails. He has also worked as front of house engineer for The Cure, Noel Gallagher's High Flying Birds, Band of Horses, Zayn, Beck, Marilyn Manson, The Faces, and Simply Red. Hanan Rubinstein is a New York City based multi-instrumentalist, vocal coach, producer and sound engineer. Hanan is currently the guitar player in the Alicia Keys band and the owner/chief engineer of Birdie Studios. Yurii Barybin is a sound producer and mixing engineer, production manager, technical director, live sound engineer, audio systems engineer, personal in-ear monitor systems designer, recording and mastering engineer, author of the patented Diversity Source Monitor Audio Mixing Technique. Full member of Audio Engineer Society (AES) and member of Ukrainian Union of Audio Engineers, Grammy Recording Academy member. ↑ "ProSoundWeb – When "Big Mick" Talks, Sound Engineers Ought To Listen!". 11 August 2001. Retrieved 20 August 2018. ↑ "A conversation with Big Mick Hughes, Front-of-House Engineer for Metallica". Audio-Technica. Retrieved 20 August 2018. ↑ "James Hetfield interview – "We call him Full Roar for a reason. He turns those faders up and doesn't stop."". Archived from the original on 19 December 2016. Retrieved 20 August 2018. ↑ Big Mick discusses the evolution of the drum sound Archived 22 September 2007 at the Wayback Machine . ↑ "MusicMight :: Artists :: RADIO MOSCOW". 15 August 2016. Archived from the original on 15 August 2016. Retrieved 20 August 2018. ↑ Really1980 (9 June 2007). "Roadies 2 – On The Road Again (The Wildhearts) [Part 1]" . Retrieved 20 August 2018– via YouTube. ↑ Really1980 (9 June 2007). "Roadies 2 – On The Road Again (The Wildhearts) [Part 2]" . Retrieved 20 August 2018– via YouTube. ↑ Really1980 (9 June 2007). "Roadies 2 – On The Road Again (The Wildhearts) [Part 3]" . Retrieved 20 August 2018– via YouTube. ↑ "The Wildhearts – Coupled With". Discogs. Retrieved 20 August 2018. ↑ Bozza, Anthony (11 October 2001). 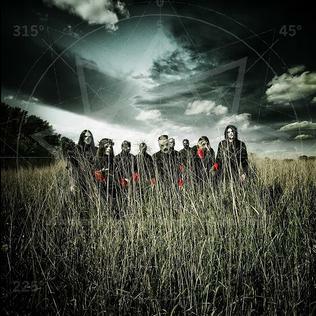 "Slipknot: Highway to Hell". Rolling Stone. Retrieved 20 August 2018. ↑ August 2006 entry on Viper Productions news page Archived 26 June 2010 at the Wayback Machine . ↑ Definitive article on the production of the Ahmet Ertegun tribute Archived 17 July 2011 at the Wayback Machine . from Total Production International magazine. Archived 21 August 2010 at the Wayback Machine . ↑ "MIDAS – MUSIC Tribe". www.midasconsoles.com. Archived from the original on 4 September 2012. Retrieved 20 August 2018. ↑ Details of microphones used at the Led Zeppelin reunion Archived 7 July 2011 at the Wayback Machine .